This has to be one of my favourite outfits I've ever worn, it's quite grungey, simple, comfortable and it has lots of velvet. What's not to love? Well, the belt did slide up to my ribs a few times, damn slippery leggings. I finally found a space inside my house with half-decent lighting, yay! I'd prefer a plain background but no way hosé am I moving my beloved blink 182 poster. look lovely, leggings are amazing! Super cute! Leggings and skirt look great and I love your nails!! Love this look! And that belt! TDF! Those leggings are amaaazing!! Ebay has some real gems sometimes, cute blog, I'm following!! Great look! Love the leggings! I love velvet on velvet. Your shoes are so funky, though wish I could see the color of your pants better :( Thanks for leaving a comment on my blog. 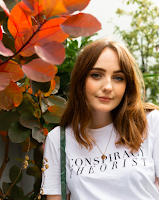 would you like to follow each other on Bloglovin as well? love the belt... cool blog, would u like to follow each other?